The Flow metering device is designed to volumetrically monitor small flow rates on low pressure lubrication systems. Its operation is based on the progressive system operating concept. The displacement of a calibrated sequence of spools in the device, generated by the passage of the flow of oil, is detected by a proximity sensor. The device is mounted on a base plate that allows its removal, calibration and substitution without the need to disconnect tubing. 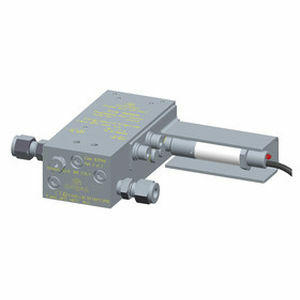 laser level sensor / for solids / for storage tanks .